I found Pimp That Snack last year and spent some time enjoying the pimps. 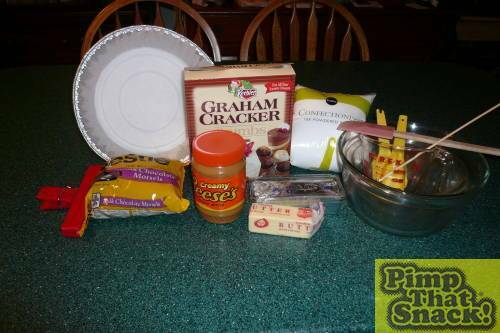 Being inspired myself, I made a giant Reese's Peanut butter cup as a dessert for Thanksgiving 2006. I failed to document it, so this year I planned to repeat the process, with pictures. Looking at the other Reese's pimps, I found that most of them just used regular peanut butter when in fact the inside of a true cup was not peanut butter of the make-a-sandwich variety. I did some research on the net and found several good candidates for recipes, mostly from Buckeyes (chocolate dipped peanut butter balls). After a couple of experiments, which my friends enjoyed critiquing ("too runny," "pretty good," "does the burning stop? "), I found the right recipe. Aluminum casserole pan $1.49 or use whatever seems right for you (it had the right shape). 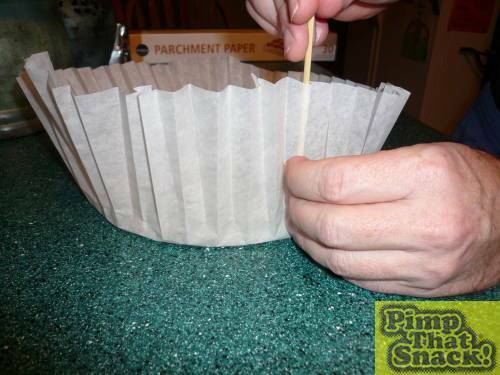 Parchment paper $2.50 for 24 foot roll, you'll use about 3 feet. 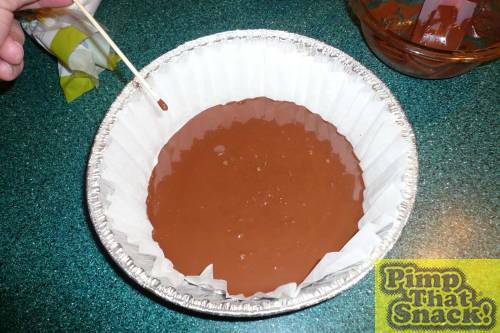 You start by preparing the pan for the chocolate. I took the parchment paper, cut a big circle out and figured out the inside diameter of the pan. Then, using a small wooden stick, I proceeded to fold the edge back and forth to get the nice crankily type of edges for the giant cup. I did this the night before, and I went through 1 � episodes of "Dirty Jobs" while doing it. The next night, I started with the bottom layer. 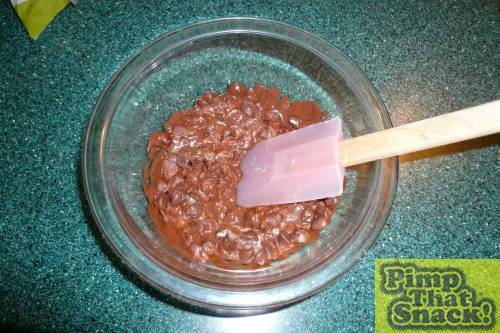 Using a glass, mixing bowl, I poured about 1 cup of milk chocolate chips into it and added 1 tablespoon of shortening. This gets the mixture to flow better when it is melted. Using short bursts on low power, I melted it in a microwave. 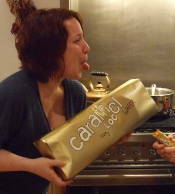 If you are using baking chocolate, the double boiler over water works better, but chips handle microwaving pretty well. However, they will deceive you as you watch them through the glass by NOT looking melted. Take them out and stir with a spatula to teach them a lesson. When you have it flowing well, give it a few more seconds of radiation, then pour into your mold. Check the depth of your bottom layer with a toothpick, fork or some other marker. 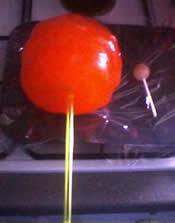 I used a wooden skewer, marked at how deep I wanted the bottom layer. I then gave it some short shakes back and forth to get the layer to even out and the trapped bubbles to rise to the surface. Put it in the fridge to set. Here comes the good part. The graham cracker crumbs are made for pie crusts. Some of it is fine, and some is course. 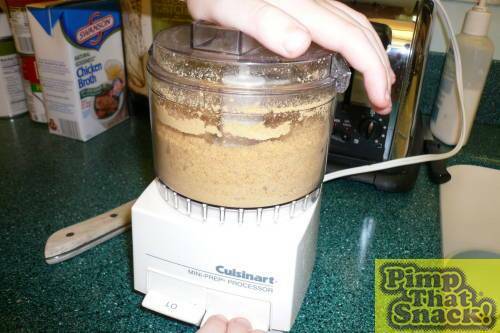 I wanted much finer grains, so I started by putting about � of a cup in a mini-food processor (you can use a blender or skip this step if you wish) and pushing the "11" button. After a bit of noise, I have molecule-sized crumbs. Set aside for now.